First Sentence: “Oh damn!” said Lord Peter Wimsey at Piccadilly Circus. 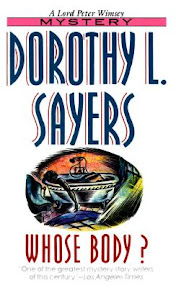 Reason for Reading: The monthly reading challenge in the Yahoo book group Mostly Books was to read a book by Dorothy L. Sayers. Why several others chose to read Gaudy Nights, I couldn’t in good conscience begin a series in the middle, and so I decided on the first Lord Peter Wimsey novel. From the Publisher: A naked body is found lying in the tub, a gold pince-nez perched before the sightless eyes. Telltale signs indicate that the face was shaved after death. Despite evidence to the contrary, the police are certain that the victim was a prominent financier. Lord Peter Wimsey knows better, but can he prove it? First published in 1923, Whose Body? established the disarmingly debonair, and somewhat foppish, Wimsey as one of the most enduring characters in English literature. It remains one of the most significant — and most charming — of the Golden Age mysteries. Comments: I am always up for a good mystery, one that catches me in its hook and reels me in. While I enjoyed Dorothy L. Sayer’s mystery novel, Whose Body?, it did not pull me in as much as I would have liked. The story itself was sound, however, several of the characters seemed underdeveloped. Fortunately, however, the author wastes no time in setting out the puzzle pieces and then unraveling the mystery, which was quite compelling. She often used dialogue to imply action throughout the novel, which is not something I come across very often. Of the characters, Lord Peter Wimsey is a charming character, his eccentricities, wit and intelligence making him even more so. His mother is quite an entertaining woman herself. I would like to have known more about Parker. Perhaps his character is more ferreted out in later books. My favorite character, however, is Bunter, Lord Peter’s valet. He is sort of the Watson to Lord Peter’s Sherlock Holmes. Whose Body? made for an enjoyable light and witty mystery overall, but I have no plans to rush out and read more by this author any time soon. Favorite Part: My favorite part was probably the flashback scene. It shed unexpected light on the characters of Lord Peter and Bunter and their relationship. Another scene that caught my fancy and had me chuckling out loud is when Lord Peter speaks with the Appledores. To give away much more than that would be a sure spoiler, and so you will have to read the novel for yourself to see what I mean. Note about the Author: Dorothy L. Sayers said of her character Lord Peter once that he was a mixture of Bertie Wooster and Fred Astaire. Miscellaneous: This past weekend Anjin and I went to see A View From The Bridge, a play by Arthur Miller, put on by our city’s local theater group. My cousin had extra tickets and invited us along for an evening of entertainment and culture. I had never read or seen the play before—much less heard of it, sad to say. It was an interesting and tragic story and the performances were very well done. I had a similar reaction to Whose Body? when I read it last year. From what I heard, Lord Peter was an exceptional man. And he was in this book as well, but I also didn't feel that instant connection with him or the story. However- I have at least the next three in the series on my shelf so eventually I might journey back to Edwardian England and go a bit further, if my Wimsey takes me there! Reading the series in order . . . that's something I keep meaning to do, but whenever I see one in the library that I haven't read, I borrow it regardless of what number it is. I haven't read Whose Body?, but I think I'll have to, to see how the series started. And I do love Bunter! Aarti - I commented on your blog in response. 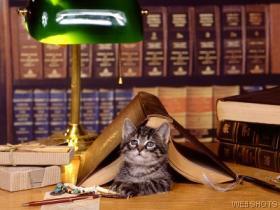 :-) I look forward to reading your thoughts on other books in the series! I'd strongly recommend that you try Gaudy Night, as it is set in a female college at Oxford (a mileu dear to Sayer's heart) and features the romance between Wimsey and the intrepid Harriet Vane. A Wimsey novel with Harriet in it is much more enjoyable than without- trust me! Reading Gaudy Night made me want to go to university.